Well, I had a great time at the SARA West conference. Everyone was really nice and welcoming, and there were many amazing presentations. Honestly, I didn't know quite what to expect. I've done a little bit, a very little bit, of radio astronomy with my students: some Project Jove, some meteorite detection using ionospheric reflection. But mostly, my astronomy work has been with neutrinos on the IceCube neutrino detector at the South Pole, and the Fermi Gamma-Ray Space Telescope, and “regular” optical astronomy using telescopes that look like telescopes. 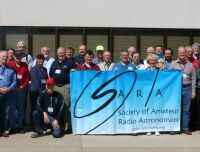 SARA was once again represented at the Orlando HamCation. Tom Crowley and Dennis Farr attended the show and displayed IBT and SuperSID while giving out membership and grant information brochures. Bok Academy offers a unique educational opportunity that exemplifies and honors the life of the philanthropist Edward W. Bok, who in the 1920’s, created a sanctuary of beauty, serenity, and peace in Lake Wales. Bike trips to Bok Tower Gardens enable our students to really connect with the legacy of the Bok family. The project took a lot longer than anticipated due to hurricane Irma, which in 2017 destroyed the dish they had installed and one of their main buildings.